Posted on March 15, 2019 at 8:15 am. Several seniors, as part of our Senior Projects, have organized the annual “Night in a Box” event at Wakefield on Thursday, March 14. The main focus of the “Night in a Box” is to understand the plight of our homeless neighbors better. 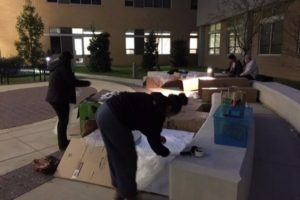 Participants will experience an environment similar to that which homeless people have to endure; we will be sleeping in a cardboard boxes for the duration of one evening in the Wakefield courtyard. “Night in a Box” will be an excellent opportunity for us to raise awareness in our school community. We also started a Gofundme page to raise money for A-Span and would very much appreciate your help by contributing to our cause.The link to the Gofundme page is bit.ly/niab2019. A donation of any size will help!